Cairo Dock 2.0.0 is Here (Linux Dock Menu)! Not so long ago I was telling you about the new version 2 of Cairo Dock which was at the time still in beta/rc and that it doesn't look at all like the old 1 branch - this new version is by far the best dock menu application I've seen for any operating system. * New applets : keyboard indicator, mail, quick browser, Toons, weblets. * The config panel has been widely rewritten. * Great improvment of the Taskbar ergonomics. * Desklets can be rotated in 3D. * Dialogs have many different window decorators. * A lot of new themes, old ones have been reviewed. * The Theme Manager can now download new themes on the server for many applets : clock, dustbin, Cairo-Penguin, Toons, etc and can build theme packages to easily exchange themes between users. * XGamma : added the ability to setup a custom luminosity on startup. * Shortcuts : added display of disk space. * Clock : smooth seconds' needle movment. * Slider : 3D transitions betweens slides and Exif data. 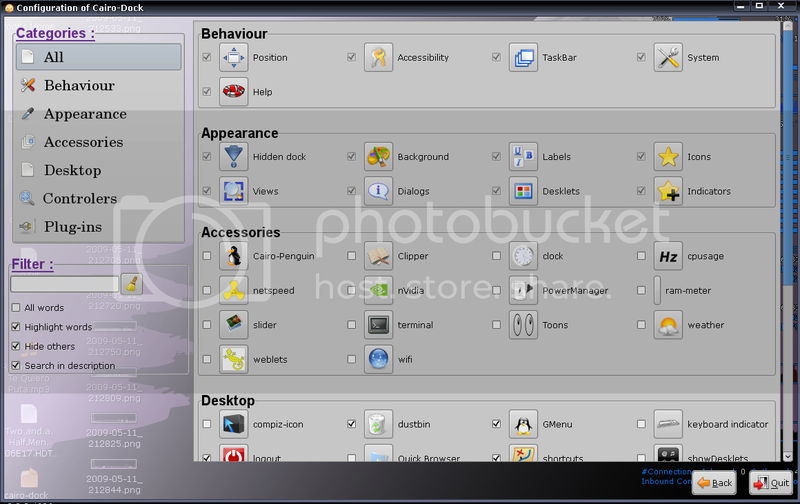 * Rhythmbox : 3D themes. * Direct scroll on many applets : XGamma, Slider, AlsaMixer, etc, and also on applications' icons. Then download the new version from here (for Ubuntu, there are pre-build .DEB packages). - don't forget to download both Cairo-Dock and the plugins package. To add it to your startup applications, go to System > Preferences > Startup Applications, click Add, put in any Name and in the Command field, enter one of the two commands above (whichever suits your graphic card). Note 1: Of course, you need Compiz enabled for this to work. Read about it here if you don't know what i'm talking about. Note 2: On some old video cards and Intel cards, the OpenGL mode shows a black screen but I just tested the updated drivers (for Intel) from the repository for Intel and some other graphic cards I wrote about and it worked in OpenGL mode. Update: There are also Ubuntu repositories available for the new Cairo Dock, which you can find here (you will find instructions for adding the repository on that page). Update 2: Cairo Dock 2.1.0 was released with lots of improvements.